Have You Been Hurt on a Construction Site in Queens? The risks that construction workers take on a daily basis often go unrewarded. Getting hurt on the job can be devastating for Queens construction workers and their families. To make matters worse, workers’ compensation packages can be paltry in comparison to the emotional and physical distress caused by an on-the-job injury. 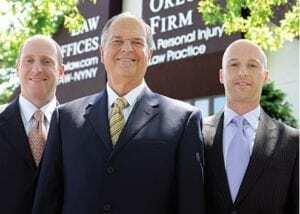 We have represented injured people in Queens for more than 30 years. For a free consultation, call (646) 647-3398 or contact us online. Your first step should be meeting with lawyers in Queens who understand construction site accident cases. When you do, you may find that you can still recoup costs for medical expenses, pain and suffering, and even punitive damages against a third party. Plus, you have absolutely nothing to lose by examining your situation further: Your initial consultation with the lawyers of The Orlow Firm is FREE. Many construction industry employees in Queens are surprised to learn that New York law prohibits them from suing their employer or a fellow worker following an on-the-job injury, even if the negligence of an employer or fellow worker clearly caused the accident. Why are the prohibitions in place? Because lawmakers sought to promote workplace harmony by limiting lengthy legal battles between workers and between workers and employers. The father-and-sons team at our Queens law firm have handled hundreds of personal injury claims, including numerous third-party claims following construction site accidents. Schedule your free consultation with our Queens-based attorneys at (646) 647-3398. You can also email us.